15n20 & 1084 tool steel, copper, and sterling silver. 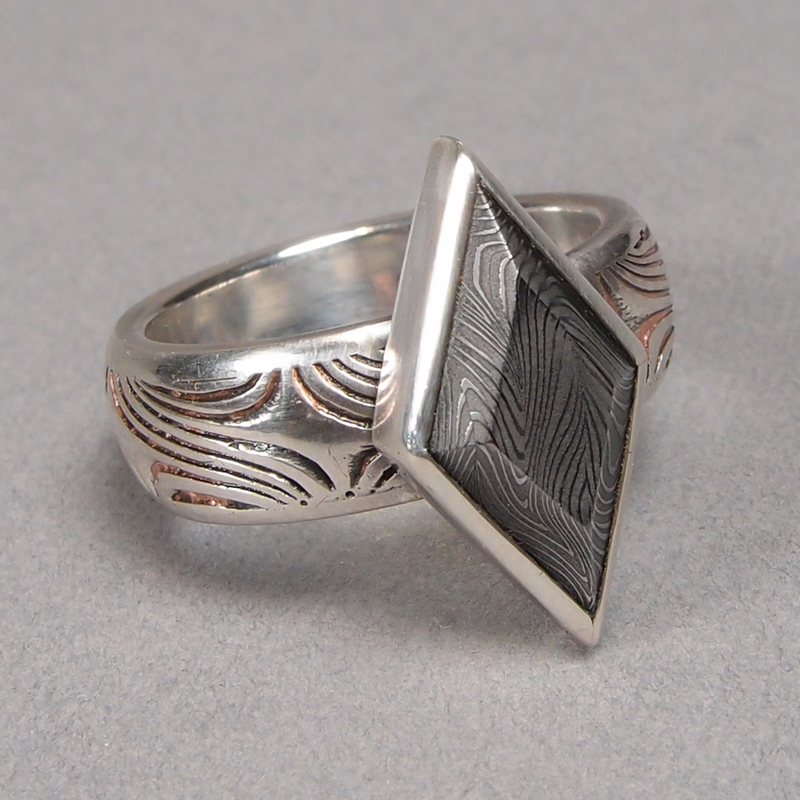 I made this ring when I was fresh out of undergrad, and I consider it to be a major turning point in my development as an artist. I was working for a large commercial jewelry company at the time, and to say that I was disillusioned would be a massive understatement. I wasn’t a bench jeweler or an artist, I was a faceless assembly line worker who toiled away on one phase of someone else’s work. The catalyst for this piece came from this enviornment; it came from observing what was considered proper by this company, its competitors, and its clients in terms of jewelry design and aesthetics. It honestly seemed like the metalworking present in this jewelry was just a means to an end, and the precious hunks of rocks they set with it were what people really cared about. 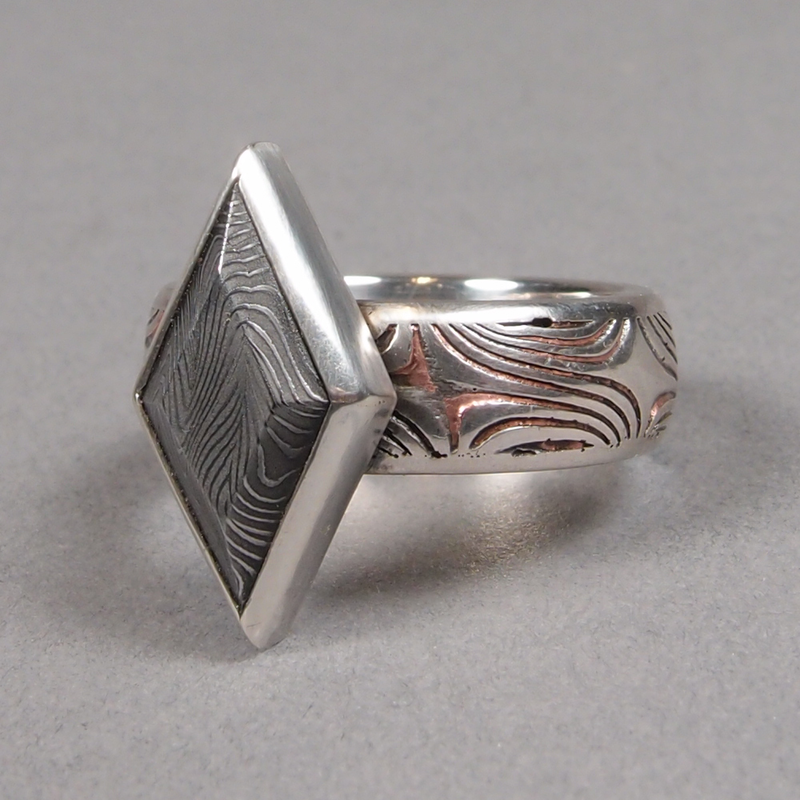 It was at this time that I was working on a seamless mokume ring during my time off, and someone in the communal studio that I was working in contaminated the soldering are with some kind of foreign metal—resulting in horrible pitting whenever I heated the ring up for soldering. I was livid, but determined to do something with this ring. After assessing the damage (both from soldering and from throwing it across the room) I found that it was mostly concentrated on one spot. So, I ground that down, etched the rest of it, and decided that setting something on top of it would sufficiently hide the damage. However, given my frustration with my job, I did not want to put a stone on it. Instead, I took some of the scrap left over from my Damascus Steel Sawframe, and started cutting and faceting it like a stone. 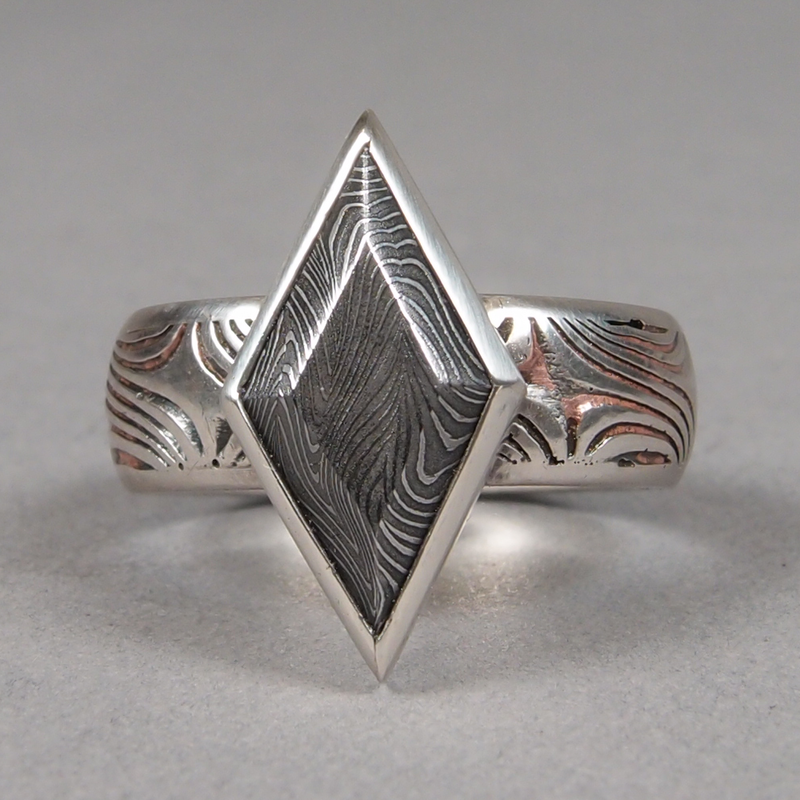 It was polished, etched, and set on top of the ring, and in doing so I made a piece of jewelry that rejected stones in favor of celebrating metalworking.